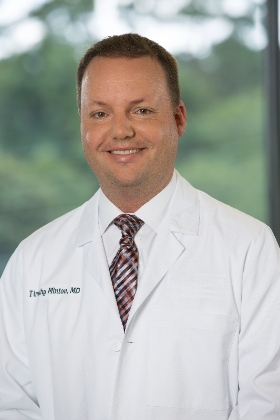 Dr. Timothy J. Minton is the region's only Fellowship Trained, Double-Board Certified Facial Plastic & Reconstructive Surgeon. He is a highly trained sub specialist surgeon whose practice is completely dedicated to providing the highest level of care and service in the field of facial plastic surgery. He has extensive training and experience with functional and cosmetic nasal surgery (rhinoplasty, septoplasty, sinus surgery), head, face, and neck skin cancer reconstruction, cosmetic facial and neck surgery, and non-surgical facial rejuvenation. He proudly serves patients in the greater Savannah region, as well as the Lowcounty of South Carolina including Bluffton and Hilton Head. He earned his medical degree from the State University of New York and was elected to the Alpha Omega Alpha Medical Honors Society. He then completed a 5 year residency training in Otolaryngology/Head & Neck Surgery which included extensive training in reconstructive facial plastic surgery. He was then accepted to a prestigious fellowship with the American Academy of Facial Plastic and Reconstructive Surgery in Latham, New York. Dr. Minton continued his career by serving as the medical director of a medical spa and aesthetic center and chair of the surgery department in his previous practice in New York. In addition to these achievements, Dr. Minton has been committed to education and research throughout his career, having co-authored several articles and two book chapters on otolaryngology and facial plastic surgery. He has also given more than twenty presentations on these topics at various medical conferences. Dr. Minton is a Diplomate of both the American Board of Facial Plastic & Reconstructive Surgery and the American Board of Otolaryngology Head & Neck Surgery. He is an active member of many professional organizations, including the American Academy of Facial Plastic and Reconstructive Surgery and the American Academy of Otolaryngology, Head and Neck Surgery.